I’ve been wanting to read something by Nicholas Rossis for a while, as he’s a frequent visitor to this blog and seems like a really nice guy. 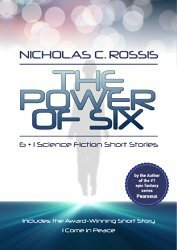 I had planned to write about The Power of Six, his short story collection, as the first post of a new feature which I’m tentatively calling ‘First and Last’. In this feature, I’ll review the first story and last story from a collection. My theory is that a collection will probably lead with its strongest (or at least most representative) story, and that the second best story will go at the end since it’s the last thing a reader sees before making a word-of-mouth recommendation or writing an Amazon/Goodreads review. If I’m correct, I can skip a lot of mediocre stories by cherry-picking the best material from multiple collections. Simulation Over: This story has an interesting take on artificial intelligence; it’s an idea which I don’t think I’ve read about before; it’s possible I’d never even thought about it before. The story also reminds me very much of an ancient fable, but I’m afraid that stating which one would be a bit too much of a spoiler. Perhaps I can mention it in the comments section if my readers really want to know – or even better, they could just read the story online. For the Last Time: This is a time travel story, where the main character interacts with other instances of himself. I thought it would end with an infinite loop, but it went in another direction. Nicholas has also written another time travel story, “Shoot the Devil“, which doesn’t appear in this collection, but again has an angle which I don’t think I’ve seen before in science fiction. The Hand of God: I was starting to get into the characters in this story, when its “twist” completely blindsided me. I personally didn’t really like the twist, but I guess if you again thought of it in the context of extremely advanced artificial intelligence, it could make sense. I Come in Peace: I liked how this story combined contact with an alien species and a character with a peculiar psychology. It also raised an interesting philosophical question: was the character better or worse off after contact with the alien? A Fresh Start: This story, like another I recently reviewed, might make you think about what your personal utopia would look like, and might also make you think about ways that bubble could burst. The Sentry: This story has a non-human protagonist. The “twist” identifying the nature of the protagonist came too early in the story for me, I would have preferred it to be more of a surprise ending. This collection also includes a bonus story by another author, Amos Carpenter, and a preview of Nicholas’ novel Pearseus . These stories are all idea-driven; several of them have interesting characters, but it’s really the idea that’s in charge rather than the characters, plot, or setting. Most good science fiction short stories probably share this attribute; I don’t know if there’s really room for intricate plots or memorable characters in the short story format. It’s fairly apparent from context that “their deaths” refers to the character’s parents, but my brain ran off on a tangent. What if it referred to the delivery men? Is this a story about a serial killer? How does he avoid being caught, since the victims are coming right to his house? Does he put on their uniforms and finish out their route for the day? Pronouns which cause me to think about serial murder aside, I’d recommend this collection for some innovative sci-fi ideas in an easy to read format. Reading these stories has also pushed Pearseus higher in my reading queue; if you’ve read it, let me know what you think in the comments section. I’m glad you enjoyed it. I’ll add Pearseus to my next reading binge.